Payment Mode- DD in Favour of "National Institute of Unani Medicine" Payable at 'Bangalore'. Professor- Passed PG Degree in Unani Medicine and 5-15 year Teaching Experience. Reader- Passed PG Degree in Unani Medicine and 5-10 year Teaching Experience. Lecturer- Passed PG Degree in Unani Medicine. RMO/Clinical Registrar- Passed Degree in Unani Medicine. Radiologist/Anesthetist- Passed MD in Radiology/Anesthesia and W0rk Experience. Biostatistics- Passed M.Sc in Biochemistry/Bio-Statistics. Asst Librarian- Passed B.Lib Degree and 5 year Experience and Computer Course. Staff Nurse- Passed B.Sc Nursing/Diploma Nursing and 1-3 year Experience and Registered in Nursing Council. Head Clerk/Store Keeper/UDC- Passed Graduation and 30 wpm Hindi/English Typing and 0-4 year Experience. System Admin- Passed Graduation and Diploma in Computer Application. JE/Pharmacist/Electrician- Passed Diploma n Engineering/Pharmacy. ECG Technician- Passed B.Sc Degree and 2 Year Experience. LDC/Steno- Passed Intermediate and Steno/Typing Speed. Jr. Library Assistant- Passed Certificate in Library Science. Pharmacy Asst/Attendant- Passe Matric/Intermediate and 3 Year Work Experience in Similar Field. Physiotherapist- Passed Degree in Physiotherapy and 2 year Experience. 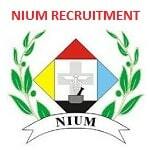 Eligible Candidates can Submit NIUM Various Post Recruitment 2019 Application to the Official Address Latest by 23rd April 2019. Applicants First Open NIUM Bangalore Official Website. Click on Inviting Application for Various Teaching and Non Teaching post advt no.2/2019 link. Fill Application form, Affix Colour Passport Size Photograph, Send Application Along with Required Documents in a sealed Envelope Superscribed with Application for the Post of.........and method of Recruitment. Send Application to the Address : The Director, National Institute of Unani Medicine, Kottige Palya, Magadi Main Road, Bangalore- 560091. Application should reached Latest by 23rd April 2019.